Whether you’re a city dweller or a rural homesteader, the outside environment isn’t always the safest thing for a pet. And that’s nowhere more true than when it comes to a rabbit. A fluffy, soft and unbelievably cute bunny rabbit is simply no match for the host of predators in both the natural and animal world. A smaller bone structure and a skittish temperament equals easy prey. On the other hand, forcing your rabbit to the confines of a cage is equally unsafe. A rabbit needs play as much as they need food and water. They need fresh oxygen. Warm breezes. And above all, reassurance. But finding the right harness for your rabbit is critical for one simple fact: your rabbit needs to breathe properly. They’re already facing a potentially stressful situation; and you don’t want to add to that pressure by restricting their breathing. But which is the best for you? We’ve put together a handy guide on what to look for when selecting one. 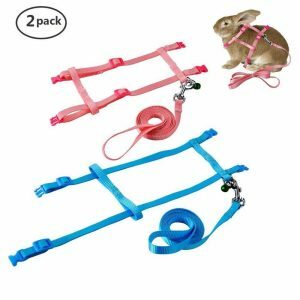 But before we do, let’s take a look at some of the best rabbit harnesses available on the market. 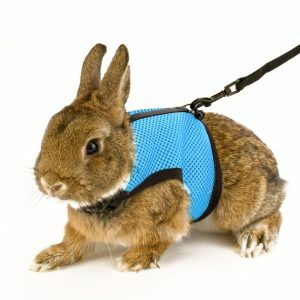 With an extra nylon strap with snap buckle and padded, durable mesh material, you can rest assured of walking your rabbit through some of the most bewildering situations with comfort and ease. a neck circumference of 6.3 – 7.9 inches and a back circumference of 4.8 inches, with an elastic leash that can extend to 98 inches. Made of durable nylon and mesh material and extra padding, this leash is ideal for smaller rabbits between 3 – 6 lbs. 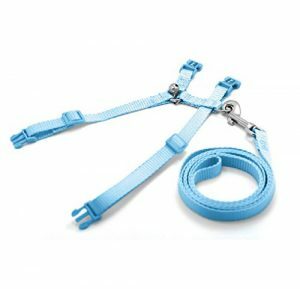 Fully adjustable at the chest and stomach, and featuring a stomach circumference between 9.8 – 12.6 inches, and a fully elastic leash capable of extending up to 47 inches. With an added value of an additional harness for your rabbit’s play friend and a handy safety bell to notify you of their whereabouts, this harness also boasts of a high quality breathable nylon material and a quick release snap. Features a neck circumference of 7 – 10.2 inches and a stomach circumference of 7.8 – 11.8 inches, with a leash extending up to 47.2 inches. 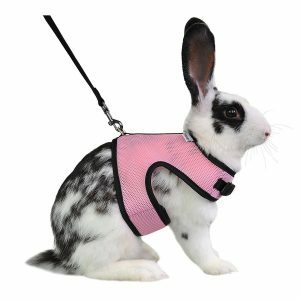 Designed specifically with smaller rabbits in mind, this harness also comes complete with a small safety bell. 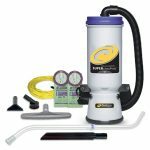 Easy snap release technology makes this simple to slip on, and features a neck circumference of 8 10.25 inches, a stomach circumference of 13-14 inches, and a 47 inch leash. Your rabbit will likely become anxious the first time you try to get it wear its harness, so the important thing is for them to trust both it and you. Never force it on them; and only until it is absolutely secure with it, keep it indoors. You can encourage their comfort with it by associating it with favorite treats or games. It’s also important to keep it away from loud or high stress level areas when you take them outside for the first time. 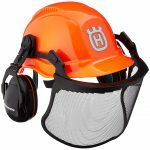 When it comes to selecting your harness, safety is critical. Because rabbits can run incredibly fast, you need to make certain that they’re fastened securely. But there’s a fine balance to be struck. Too secure and you could restrict their breathing, irritate fur or even cause damaged bones. 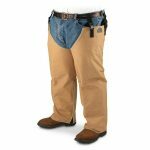 Secure locking systems with adjustable straps are ideal in promoting comfort. Full harnesses (which resemble a full coat) are typically made of a nylon or mesh blend and frequently come with additional padding for comfort. But at the cost of slightly restricted freedom of movement. 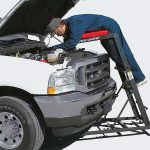 Strap harnesses, which frequently have plastic lock features and adjustable straps, can allow for a greater freedom of movement; but unfortunately with the drawback of occasional strain. Ultimately, it’s a question of your own rabbit’s temperament and character. Neck collars are absolutely not recommended due to safety fears and threats of broken bones or worse; choking. Above all, remember that your rabbit is not your dog. They will not only be much less eager to accompany you on a walk; they’ll likely be frightened of it. At first. They will likely need to be trained, and they’ll likely have to need a great deal of time to acclimate to it. Make sure you’re doing it for them, and not yourself. But chances are, with a little time and exploration, they’ll learn to discover a whole new world waiting for them.